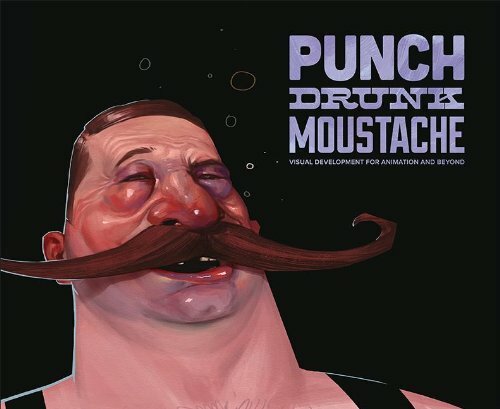 Punch Drunk Moustache is an artbook that consist of work from 8 artists from the animation industry. The artists included are Amy Beth Christenson, Max Lim, Jeff Sangalli, John-Paul Balmet, Will Nichols, Nate Watson, Sean Pando and Chris Voy. Each artist came up with an idea and concept and developed the visuals for it. The ideas can be as weird as the title of the book. Amy Beth Christenson was inspired by H.G. Wells and came up with WWI that's fought by giants. The concept art look like they could be used for movies. Will Nichols created a little robot with a head that resembles an afro haircut. Sean Pando tells us how dart frogs earn their colourful patterns and poisonous skin. Jeff Sangalli's Creature Hunter reminds me of Monsters Inc but the monsters here are, well, different. Other formats include a comic and an illustrated story with pictures. And it seems like everyone has to draw their own version of that boxer with long moustache that's on the cover. Punch Drunk Moustache is like a cocktail mixed by different people but you can still taste the distinct flavours. Interesting.